I have written about his before, and in fact devoted pretty much an entire chapter to this subject in my book under the chapter of Apollon Agyieus, but during this season I was inspired to write about it more intimately in my blog. Apollon is, as we understand from his epithet Agyieus, the god who presides over the roads. This aught not be mistaken for the role of Hermes which is directly related to that of Apollon (and the Homeric hymn to Hermes does conclude that they are the closest of brothers, not to mention both of these gods are honored together in the domestic cult outside the courtyard gates). Whereas Apollon has the roads within his domain, Hermes is the god upon the roads, the companion of travelers and guide though Hermes is more commonly thought of in association with roads via his herms and sacred points at which he is honored as the god of travelers. But all of this does not pertain to the roads themselves, which is under Apollon’s providence. So to sum up some of the important points: the function of the road, other than acting as a social nervous system, is to lay out the travel from the point of origin to the destination. This can be seen literally such as in the myth in which Apollon, in the form of a dolphin intercepted the Cretan ship and guided his soon-to-be-priests to Delphi. And metaphorically as the god serves to lay out the road of the future, particularly onto heroes, which is reflected in the god’s role as an oracular deity. It can be said that Apollon, the harmonic organizer of the spheres enthroned at the axis, leads movement by his purpose and actions. And this movement is quite often of a round, in which their are the orbits about the axis, the dancers about the musician etc. And what better symbol is there of this than the labyrinth, the form of which Apollon was honored with by the populace of Delos in the Crane Dance first introduced by Theseus who, by Apollon’s (and Aprodite’s) guidance safely manuevered the labyrinth of Minos. 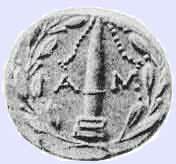 There are even coins from Crete which depict Apollon on the face and the labyrinth on the rear, Much of this laying of the roads is directly provided from Zeus to whom Apollon serves as the voice of Zeus (which may also explain alternative coins from Crete which featured the head of Zeus instead), but much of it also directly from his own domain and function within nature and the cosmos. And nothing makes this more profound than the feeling of the passage of the year, especially with winter during which all things retreat. Persephone has retreated from the company of the gods, the earth is barren, animals are hibernating, and even the people have more and more retreated into the warmth and comfort of their homes. The autumn and the winter often deal with this idea of retreat beginning with the storage of food for the winter and the focus on the hearth and family, and the cold dark nights of winter which gathers all within. It enters within and spiral down into the heart of the labyrinth. Every spring during the Thargelia I dance a dance that I have created in which I spiral inwards and then emphatically outwards. Spring has long since come in her full glory. I may not do this dance during the winter, but it is a cosmic dance that doesn’t necessarily need dancing. Even Apollon has moved away, to the far places in Hyperborea, the origin point of his maternal family. It is a place of rejuvination and the starting point of new beginnings as we refresh and await for the return of spring. Oh those delicate dancing seasons that Apollon summons on his lyre! And the dance will begin again outward, expanding with life. And there is Artemis leading the dancers, the most lovely of all the dancers by her art. The huntress who drives all down the roads of her brother. But of course they are dancing! And the labyrinth is symbolic of the sacred group over which Zeus had given him governance in his domain. So in this winter season, as Apollon is away, and Artemis too for that matter as far as I understand enjoying their maternal root, lets give thanks to the divine mothers, and to the earth and night who are the mothers of all, and to the far-shooting god and goddess who will light up the road again for us to travel forward. I am of the opinion that the relationship between the Olympians, wherein it can be broken down into segments of close relationships between very specific deities (such as for instance Apollon and his twin Artemis) that the Olympians altogether interact and are working together in ways that we may never really expect or understand. Therefore wherein it is more often that I may think of Apollon in connection with say Zeus, Athena or Artemis among the Olympians, I also must acknowledge Apollon’s roles in cooperation with the others too even if they are a little less evident on the surface. That said one of the more interesting of Apollon’s relationships that I enjoy considering is that between him and Aphrodite. Over the years I have developed a great deal of respect and fondness for Aphrodite whereas in my youth I had considerable apathy towards her (not really disrespectful but not giving two figs about her either) that changed as I matured and especially after some misadventures indirectly involving Aphrodite that gave me a healthy respect for her at the beginning of my relationship with her. Still, it took me a long time to really see how closely Apollon’s and Aphrodite’s domains touch and where they overlap. And of course after I saw it I wanted to smack myself for not seeing it earlier. Aphrodite in her nature rules over beauty, and beauty in and of itself is a harmonious arrangement to create perfection (or as near to it as we humans can get, but I think Aphrodite herself represents the true perfection beyond what we can even understand that makes her uniquely the most beautiful of goddesses). Even the name of her daughter by Ares, Harmony, clearly indicates how much a part of this attribute is imbued in the identity of Aphrodite so much so that she can take the raw energies of a god such as Ares and by her union with him she can create perfection by drawing him into a harmonious relationship with her which gives Aphrodite such a reputation as perhaps the only deity to be able to so greatly influence Ares as far as I see. In such the beauty in which she has such influence is one of harmonizing which creates the most beautiful of forms by which we can honestly call her Aphrodite Morpho, the goddess of many forms as she is imbuing beauty everywhere. How then does this relate to Apollon? Well we know from Plato’s Cratylus and Proklus’ commentary on this text that much in Apollon’s identity refers to him as a god of harmony. Perhaps not so much as a god who creates harmony, even as he is not the god who created the lyre or flutes that he bargained from Hermes, but rather as the god which perfectly utilizes these tools from other gods. This is perhaps one of the beautiful things about the Olympians, and how evident it is that they are working off of each other and cooperatively with each other is in how much of what they do is specifically tied to what another god does. And so Aphrodite is truly the mother of harmony and harmonical principles, but Apollon is the one who most beautifully uses these principles to wrought change as the seasons move around to his tune and he is successively able to gather together all the Muses into a unified train of arts. Such harmonic principles aids him too as a healer in which he restores the balance of the body, and as a destroyer of evil. Therefore it is not unusual that Apollon would have told Theseus to make Aphrodite his guide, for even as the labyrinth (the wind road) can be said to be his in some manner, the way belongs equally with Aphrodite whose strikes the harmonious accord necessary for navigating the labyrinth and to emerge heroic. This harmonizing is of course represented as the love between Ariadne and Theseus for she helped him to succeed (and the Labyrinth has been called Ariadne’s Dancingfloor) but its greater representation must be alluded when Aphrodite’s statue is dedicated to Apollon at Delos. Perhaps this is because of Apollon’s oracle, but is more likely to represent that the heroic triumph and the transofrmation that the labyrinth brings (being under the domain of Apollon in part) is a gift from Apollon, with the necessary aid of Aphrodite. For without the beautiful harmony there is no progress. Without Aphrodite’s harmony, the beauty of the arts over which Apollon reigns would fall flat and lifeless. Therefore the relationship of Apollon and Aphrodite is one that imbues beauty to the soul, and is of significant assistance to the artist.